You are here: Home » Dr. Z’s Blog » Join Us For Our GRAND OPENING CELEBRATION on Saturday, May 17th From 11-2! Save the Date! 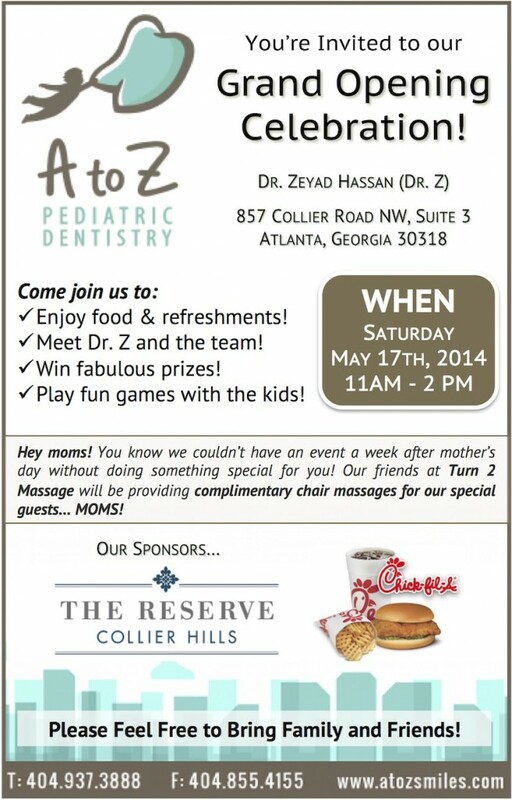 A to Z Pediatric Dentistry and Dr. Z are having a GRAND OPENING CELEBRATION at our Midtown/Buckhead pediatric dental office on SATURDAY MAY 17, FROM 11-2! We will have FREE CHICK-FIL-A food and refreshments, FUN GAMES FOR THE KIDS, FREE CHAIR MASSAGES FOR THE MOMS, and FUN PRIZES! All are welcome, feel free to bring friends!!!!!! !